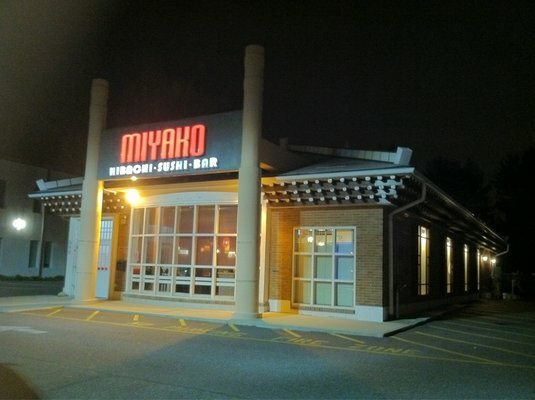 We've been to Miyako several times, maybe three times for hibachi and once for lunch in their regular dining room. The place is fairly new (2009), and it looks just so. The exterior building and interior decor have a modern feel. Six hibachi tables are on the perimeter of the restaurant with the main dining room in the center. The one time we sat in the dining room, it was just average, nothing spectacular, but I guess that's what you feel after eating there for hibachi. They do however have good lunch specials. The hibachi food is excellent, however their portions are not consistent. One time you'll have a lot of protein, little vegetables, rice and noodles. Another time you'll get a lot of veggies, rice and noodles but not as much protein. Regardless, you will most likely not finish your meal. The soup they offer at the beginning of the meal is average, but the salad with the ginger dressing is delicious. One thing my wife noticed is that there was little difference between the time she ordered steak and the time she ordered filet minon, because the filet minon was overcooked when she asked for medium. One downfall is if you don't want the fried rice that comes with the meal, they charge extra for white rice. The hibachi experience itself is always fun. The chef does what you would expect at any hibachi location, but depending on the group, he sometimes steps it up a bit. For what it is, the prices are great. I've seen some hibachi places charging an arm and a leg for okay food, but that won't happen at Miyako.